Toughman, an alternative to the Ironman-branded races, is one of the leading half distance triathlon series in North and South America. The New York state event in Stony Point is the Championship event for Toughman. A four-hour drive from the Quebec-New York border, Toughman offers a fun course that will challenge your late-season fitness. 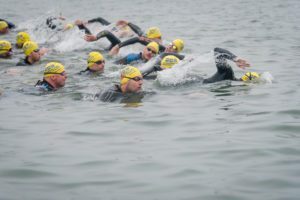 The Vermont Sun Triathlon Series takes places in Lake Dunmore and is made up of six races – including three sprint and two Olympic triathlons. The last event of the series is the Bandury Classic – a paddle, bike and run event. Doing Ironman Lake Placid? The Tinman offers the perfect tune-up race. Taking place in the heart of the Adirondacks, the Tinman offers half, Olympic, sprint, relay and aquabike events. With sprint, Olympic and half distance triathlons taking place in the shadow of Cannon Mountain, the White Mountains Triathlon offers a breathtaking event for everyone. If you choose to participate in the half, you can challenge the King of the Mountain (KOM). On the bike course, the KOM challenge begins at kilometre 29 on the climb to Kinsman Notch’s Beaver Pond – a 3K climb. Post-race, take the tramway up Cannon Mountain and enjoy the Summit Social – with beer from Woodstock Brewery, race-friendly appetizers, nutrition sampling, and a beautiful sunset across the White Mountains. Taking place in Geneva, New York, the Musselman race weekend is a short drive from the border and offers a variety of multisport races. With half, aquabike and duathlon events taking place on the Sunday and miniMussel on Saturday, you can do the DoubleMussel 88.7. This late-season Olympic and sprint triathlon is a great way to close your season in the mountains of New Hampshire. There are also aquabike and duathlon races for both Olympic and sprint events, plus relays. Taking place in South Berwick, Maine, Pumpkinman offers sprint, Olympic and half-Ironman distance races. Just a five-hour drive from Montreal, this east coast triathlon is a great way to finish off your season.